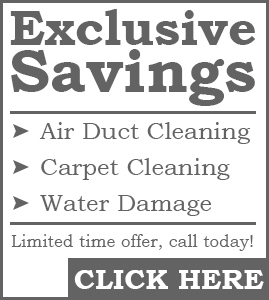 Air Duct Cleaning Services offers 24 hour air duct and vent cleaning services to the following metro areas: Alvin, Baytown, Bellaire, Channelview, Conroe, Crosby, Cypress, Dayton, Deer Park, Dickinson, Fresno, Friendswood, Highlands, Houston, Huffman, Humble, Katy, Kingwood, La Marque, La Porte, League City, Liberty, Manvel, Missouri City, New Caney, Pasadena, Pearland, Porter, Richmond, Rosharon, Santa Fe, Seabrook, South Houston, Splendora, Spring, Stafford, Sugar Land, Texas City, Tomball and Webster. Most homeowners have no idea what goes on inside their home's air ducts. But the fact is, they can become littered with years of accumulated dirt, debris and allergens like pollen, dust and pet dander. 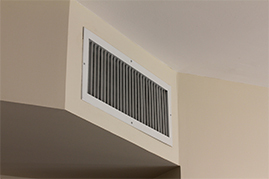 Industry standards recommend that you have your air ducts inspected every 2 years for cleanliness. Frequency of cleaning depends on several factors, not the least of which is the preference of the home owner. By having your air ducts cleaned regularly, you’ll help improve the indoor air quality in your home, and enhance the efficiency of your heating/cooling system, which may reduce energy bills. 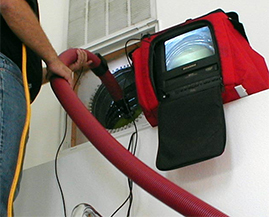 Our technicians use one of the most powerful and effective air duct cleaning systems on the market today. This allows us to clean all types of duct work and air duct systems no matter what part of the country you live in. 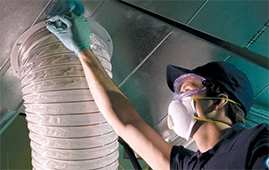 Our air duct cleaning methodology follows the guidelines of the National Air Duct Cleaners Association (NADCA), and with the expert advice from your air duct cleaning technician, you can count on us. We connect a powerful 8 inch vacuum to the main trunk line. The vacuum collects dirt, dust and other contaminants which are dislodged during air duct cleaning. High pressure air along with specialized tools are used to dislodge the dirt and debris so that the vacuum can pull it into the containment unit. The technician inserts the compressed air hose with air whip. Compressed air and the air whip remove dirt from the duct walls and push grime to the vacuum. After cleaning, our technician installs a galvanized sheet metal access panel with 12 screws over the hole in accordance with NADCA standards. The technician seals the patch with metal tape labeled UL181A. The technician seals the hole made to insert the air whip with an approved plug. After cleaning, the technician reviews the order with you to answer any questions and to make sure you are satisfied with the job. Please go online to our contact form page and fill it out if you need to contact us. Your feedback is important to us. Help your clothes dryer be more efficient with vent cleaning. A clean clothes dryer vent helps to dry your clothes quicker and reduces the possibility of a fire. You can count on our company to clean it right. We also service for emergency flooding and water removal. A water emergency can happen anytime in your home. 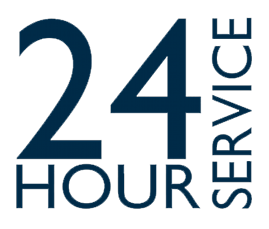 We can be there to help – 24 hours a day. 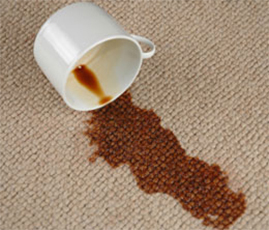 Our technicians are highly trained and certified and will clean up the water emergency as quickly as possible. We’ll review your needs and see what the best treatment is for your home’s needs. Be sure to also take a look at our many offers. These include some of the various special coupons that we offer at varying points throughout the year. Don’t forget to also invite others in your life to take a look at what we have to offer. Be sure to also refer your friends. Thanks for taking a look at our site. We hope you can take advantage of our many offers. Our services are truly valuable.